Moving Overseas With A Teen? You Need This Survival Guide! Of course, I am just kidding around with this wildlife explorer type description! However, if it seems a tween or teen around your home is hard to please, consider the tumultuous timeframe that they're going through. While sorting through a wide range of emotions, the young ones seem to have a rumble seat on the roller coaster of growing pains. It may be a bit overwhelming for a developing psyche to try to comprehend. When overseas PCS orders are cut, with tender feelings in mind, parents may be concerned how upcoming changes from a move will affect their children. Thankfully, there are helpful resources available for military families moving with teens. If a military move occurs mid-academic year, when enrolling your adolescent in school, ask about new student support programs. For example, a new arrival may be introduced to a peer that serves as a “mentor” of sorts. This student-to-student interaction can help ease anxiety with hunting for classrooms, navigating the daily schedule, or facing the somewhat terrifying lunch break cafeteria seating! If the summer break plans include a PCS, a plus for youth moving to a new location may be the amenities of the installation's Youth Center. This facility offers a variety of programs and activities for children to fill their summer break, meet others, and hopefully ease the adjustment. For military families moving overseas, most likely they will have a sponsor – someone from their unit who can offer helpful tips for the transition. As mentioned in the FREE MilitaryByOwner e-book, Overseas PCS Survival Guide, a youngster may even have his or her own sponsor. By connecting with fellow military kids through a Youth Sponsorship Program, a teen may have a better idea of what’s cool and what’s not at their new address. In turn, this may help them feel a little more like they belong. 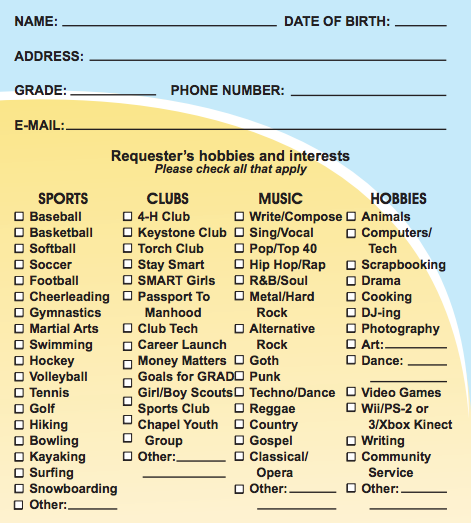 For example, at Naval Station Norfolk, Virginia, to enroll in the Youth Sponsorship Program, an incoming kiddo is given a checklist style form. This form is as easy to fill out as a Facebook quiz! Divided into 4 categories--sports, clubs, music and hobbies--the teen can mark what activities they've enjoyed in the past and note any items they might like to try. When completed, the form is returned to admin at the School Liaison Office or Youth Center, and the teen can be matched with a youth with similar interests. A connection with another teen, forged from a simple form, can make a positive difference. Learning what things there are to do or where to hang out from another person with similar taste may lead towards a sense of contentment in this new area. Gaining a sense of acceptance and belonging seem vital for an adolescent, especially if their military family is now living in legitimate foreign territory. 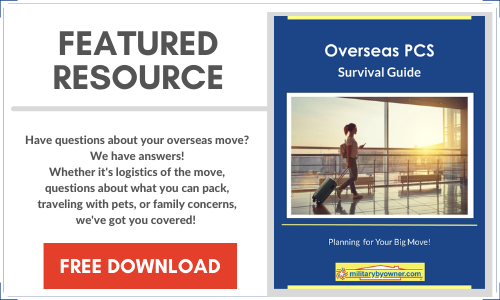 If you anticipate an overseas move ahead, consider adding this complimentary e-book to your reading list. A fantastic compilation, it includes a little bit of everything! As mentioned here, moving overseas with children is an important topic, as well as budgeting for unexpected expenses and perhaps preparing your four-legged friends for travel. Each page of the e-book offers helpful tips and good information in an easy-to-read format. Plus, the infographics are totally Pinterest-worthy! Over the years, I’ve learned to recognize that when our family is anticipating a PCS, I can quickly become a giant ball of stress. But if I have good information in my hip pocket, I may feel more prepared for an upcoming move. We here at MilitaryByOwner strive to lessen any stress levels when a military move is on the horizon. We encourage you to read through a few resource articles and browse through a bunch of blog posts. With helpful PCS information at your fingertips, it may lead to more of a smooth move for you and your family – even for the tween or teen in your life. As a wildlife explorer might say, here’s hoping "the elusive young resident of the smartphone Serengeti" will soon share an "I’m settled" smile!